Add vivid, long-lasting color to presentations. Won't skip, bubble or bead up on a hot projector. Brilliant ink is xylene free, click lock cap provides a long life. Dry Safe: several days cap-off time without drying up (test ISO 554). Universal pen for OHP and almost all surfaces. Great for marking CD's and DVD's. Dries in seconds, therefore ideal for left-handed users. 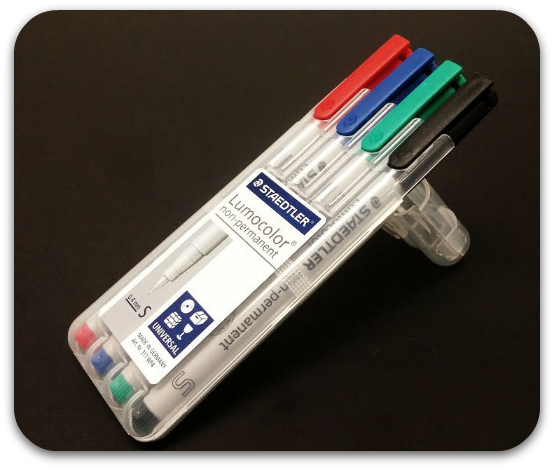 Click here to see all Staedtler Lumocolor Non-Permanent Markers!